Our Give top 25 New Professional Business Card Free PSD Templates, so make it gorgeous. These business card templates are creative and high quality designed, fully editable, customizable and well organized with PhotoShop PSD files. Corporate Business Card PSD Templates download for commercial usage. 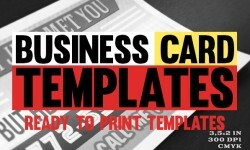 Business card mockup is perfect for corporate business or personal. This free business card PSD template, comes with vintage / retro style, fully editable layered Photoshop PSD files, ready to use, easy to modify 3.75 inc X 2.25 inc with bleed 0.25 300 dpi and CMYK color. All fonts used are free. Fonts download links can be found inside the help file.